Get the leveling ability of wool with the fine finish of a foam pad. 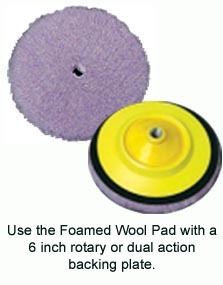 The Foamed Wool 7 inch Buffing/Polishing Pad is designed for effective paint correction with a fine finish. You’ve never seen or felt a wool pad like this one! The pad feature patented nanofoam particles that encapsulate the base of the wool fibers to help prevent caking and matting. The manufactured wool stands up better than natural wool pads to provide more cushion against the paint. The denser wool finishes like a foam pad so you get perfect paint in fewer steps. Natural wool pads have a tendency to become frayed, matted, and begin linting. The deterioration of a wool pad results in a pad that provides less cushion between the buffer and the paint, and the matted wool poses a greater risk of scratching the paint. Lake Country’s Foamed Wool is a patented process whereby microscopic polyfoam particles encapsulate the base of the wool pad. You can feel how the wool is tighter and denser than a regular wool pad. This enables the Foamed Wool 7 inch Buffing/Polishing Pads to stand up to the stress of polishing better with less caking and matting and better results. The Foamed Wool encapsulation process locks the lambswool fibers in place to significantly reduce linting. The paint surface will stay cleaner as you work with less to clean up when you’re finished detailing. All these features are great, but we know you’re really concerned about performance. Foamed Wool 7 inch Buffing/Polishing Pads are capable of removing 1500 grit scratches, leaving a smooth finish with no hazing and few, if any, compounding swirls. These pads finish more like a foam pad than a wool pad so you have to do less finishing work to get a perfect shine. Lake Country’s Foamed Wool 7 inch Buffing/Polishing Pads are manufactured for consistency and quality. Natural wool has a lot of variances and this can lead to inconsistent pad performance. That will never be a problem with the Foamed Wool 7 inch Buffing/Polishing Pads. These pads are recommended for dual action and circular (rotary) buffers. We recommend the 6 inch Hook & Loop Rotary Flexible Backing Plate or Dual Action Hook & Loop Flexible 6 inch Backing Plate for this 7 inch pad. To wash Foamed Wool Pads, dissolve 1 scoop of McKee's 37 Polishing Pad Rejuvenator in 3-4 gallons of water. Soak used pads for up to 15 minutes and use a brush to agitate if needed. Rinse and air dry face down to allow the water to drain away from the hook & loop backing. Wool encapsulated in nanofoam particles gives you results like you’ve never seen before with a conventional wool pad. Foamed Wool 7 inch Buffing/Polishing Pads from Lake Country use the modern technology of foam to bring the wool pad to a whole new level of performance. FLEX XC3401 Wolfgang Uber Swirl Remover Kit FREE SHIPPING! These pads buff paint with clear coat to a high gloss, they are excellent!